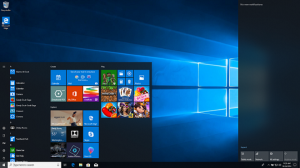 And in progression to this statement, Microsoft has introduced a new widget for Windows 10 which would enable a Game Bar which is more like an overlay seen in Nvidia’s Ge Force Experience. With the help of new Xbox Game Bar, gamers can access to different services like Spotify while going through gameplay. Moreover, players can even manage the audio output of the game which could help in better interacting with the title. Gamers will now won’t require to launch any third party software to monitor the performance of their CPU, RAM and Graphics card as the new Game Bar for Windows 10 will integrate all such monitoring tools which a user could view at any given time. The Game Bar is very easy to launch in the Windows 10 and can be operated simultaneously while accessing other resource files. By hitting the Win + G keys, players can initiate the Game Bar at any point of time while playing a game. The pop-up screen for the Game Bar is translucent which helps in viewing the ongoing game with various options floating which could be used to change the settings as required by a player. Players can quickly adjust their required settings from the game Bar and immediately continue with their gaming. Such a feature would help all the gamers but most importantly it would ease the life of all the PC gamers who live stream their gameplay on various streaming platforms. With this newly introduced Xbox Game Bar feature, gamers can easily adjust their audio output, Live chat and background music with great ease and also with this new feature a less impact would be seen on the live stream. Players can also record their gameplay directly through the Game Bar widgets and edit the captured screenshot or video before posting it on various social networking sites. Nowadays online gaming is also very trending which enables the option of multiplayer titles in which you can play with your friends and other online players. In online gaming, Xbox Game Bar could help players interact with other squad mates through instant chat. By utilizing this feature, players can easily communicate with their squad mates and strategies better while playing the game. The quick chat feature can help players in telling other players the location of enemies or required supplies which could tremendously improve on their in-game synergy. Currently, the trial phase is ongoing for the Xbox Game Bar for Windows 10, and PC gamers can genuinely benefit from this new software. More details for these new services would be disclosed in the upcoming E3 2019 until then players can avail the trial version for this exclusive service. Shery Williams is an employee at a top email service provider company in the day, and a technical writer at night. She is passionate about writing troubleshooting tips, beginner’s guides, news, and other articles on varied topics. She has written majorly on epson printer support, hp printer and canon printer etc. Additional Articles From "Website Design"
Started a New Business? Look What You Need to Succeed! Getting Visible Online is Not That Tough. Read This!